I don't use but 6 of these applications, but it sure would be nice to see the large amount of bugs in SkinStudio 10 fixed and the tree area in explorer background color issue fixed in Windows 10, v1809. I can't really think of anything else. 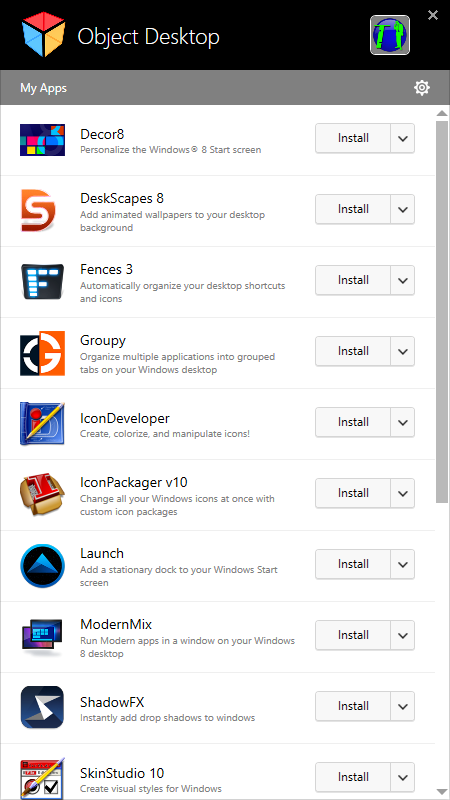 -I agree with lightstar, Fixing the bugs in Skinstudio and maybe even Updating WindowBlinds with "new" features like taking back "ownership "of the popup menues" that currently aren't skinnable for many parts of windows 10 and while I'm on the subject, Adding all the new icons that now are used in Win 10 to Icon packager....as it is now many icons aren't skinnable as they are not in Icon packager.' -Update that as well. DesktopX or a DesktopX replacement? (Yeah, right.) I agree with the above as well. WindowFX doesn't apply effects to the Start10 start menu if blur is enabled in SKS. Yet, if blur is disabled, animated start menues do not animate correctly. Can we fix this? I'd like to see an addition to IconPackager where users can add desktop shortcuts, such as Windows Media Player, MS Office apps and other programs to be also changed when those icons are included in the package. A lot of the time we have to change them manually, which can be tedious and time consuming. i would like to see a new and better working version of Object Dock also it should be included in the Object Desktop subscription! Hm... -I Hope at least some of these things will be attended to. I agree with all of the above except Object Dock. The dev who created it walked away and it has outlived its usefulness. All things considered. Fences would have an option to use some of Windowblinds elements as its frames, background, scrollbars and buttons. All they'd have to do is update the certificates for ObjectDock 1.9 so it will install on Windows 10. It worked find when I upgraded my Windows 7 to 10 and still had it installed. At least you could get one dock. You forgot the kicking part. The next Stardock Magazine will talk about the programs you mention and more. Way to go Brad, My main man !! I would love to see the weather docklet work again... please! What he said! I find OD very useful and for the life of me can't understand why it's being ignored....makes no sense. I want a DesktopX for Win 10. Anytime I get a new computer, or reinstall from scratch, *everytime*, I put on Windowblinds, Icon Packager, Groupy, and Fences. Also winstep. I would never want to have a computer without these things. I might as well have a Mac. If we’re voting, I vote for WB, IP at the least. I'd like to see a decent window manager. Windows 10 allows you to split windows to half or quarters of the entire desktop, but I'd like to see something that can handle a lot more. I've just started using a high-res Ultrawide monitor and I could easily see myself splitting the desktop into 4 x 2 windows. It would also be fantastic if windows would 'magnetically' snap to the edges of other windows or the desktop edges. Resizing of one window should also resize the other in real-time. Wait, what? In your e-mail you said ObjectDock does not work on Windows 10. What if I told you it is the only app of yours I use on Windows 10? It's one of the first apps I install whenever re-set up my computer, and is my go-to app launcher, even ahead of the W10 Start Screen. I have it on auto-hide, and love the cool animated dock effects. You probably think it obtrusive or defunct, or maybe it runs contra to Start10, but with it I have cool choices how I launch stuff. I think it's definitely worth the effort for improvement (tighter integration, and easier and slicker to set up new apps on a dock). Definitely one of my favorites besides IconPackager. In fact, I would have bought every version of Object Desktop if you included ObjectDock in it, but you never did.